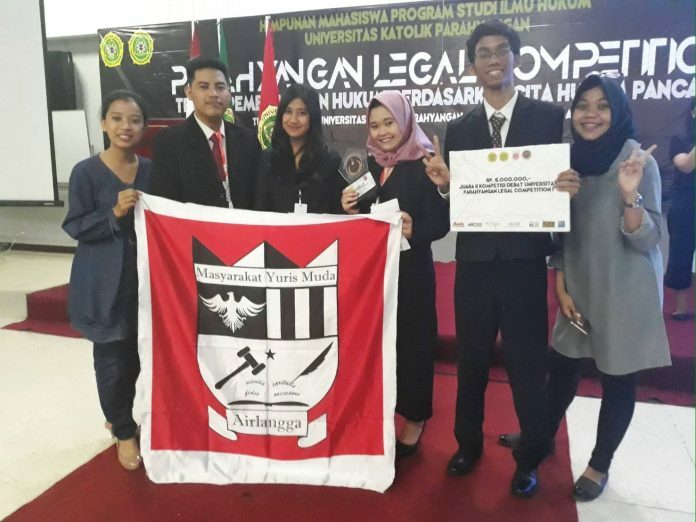 UNAIR NEWS – Students of FH UNAIR in Semi-Autonomous Body (BSO) of Airlangga Community Young Jurist (MYMA) made another achievement at national scene. MYMA as a BSO focusing on this debate field often sends its members in various debate competitions, both regional and national levels. MYMA often gets satisfactory results. The latest achievement was achieved by six students who participated in the competition at Parahyangan University through Parahyangan Legal Competition 2018. They won the second place in the event held on 6-8 April. The six students were Alip Pamungkas (2017), Safira Noor (2016), Krisna (2016) as speakers, and Adella Virgiia (2015), Cindy Cendany (2017), and Amelia Virismanda (2015) as researchers. Their success was also supported by Sevirna RA (2014) as a mentor and Ekawestri Prajwalita as a supervising lecturer. For a month, they made preparations. Starting from studying motions, drawing up pros and cons arguments, and undergoing regular exercises during classes. Safira, one of the representatives of the debating team, said that the victory achieved by her team was something to be proud of because since the preliminary round they were in the same chamber consisting of experienced teams. With hard work and team spirit, UNAIR delegation finally went to the finals. “Alhamdulillah we are very happy and a little bit surprised but thanks to our hard work and God’s blessing we are finally able to win the second place, “said Safira. Safira continued, she and her team followed the competition not only to win. “We just do our best in every competition and finally reach this stage. Honestly had followed various competition and experienced defeat. But we keep the spirit to follow the competition, “he added.